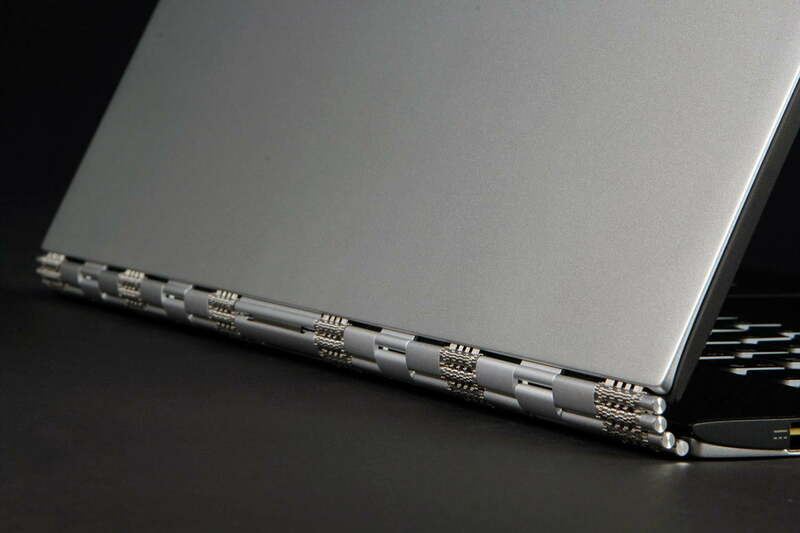 The Yoga 3 Pro's beautiful display doesn't make up for its mediocre battery life and CPU. When Lenovo introduced the inaugural Yoga notebook back in 2012, its ability to serve double duty as a tablet provided a healthy dose of innovation at a time when the PC landscape was in dire need of a big breath of fresh air. Since then, other PC makers have released their own takes on the Yoga’s design, while Lenovo has kept up by expanding the Yoga series over to its ThinkPad brand, and releasing refreshes. The latest of those, the Yoga 3 Pro, comes armed with a handful of tantalizing new bells and whistles. For starters, Lenovo switched up the display’s hinge, choosing to outfit the Yoga 3 Pro with a strip of materials that look like what you might find on a Rolex. Whenever you’re on the go with your Yoga 3 Pro, parts of it that wouldn’t ordinarily be moving will be dancing. On the geekier front, Lenovo has replaced the 4th-generation Intel Core chip in last year’s model with the newest slate of silicon to come out of Intel’s labs. This new Yoga wields a fifth-generation Broadwell-based Core M processor, which promises to usher in a new wave of thinner, lighter, and more energy-efficient devices. 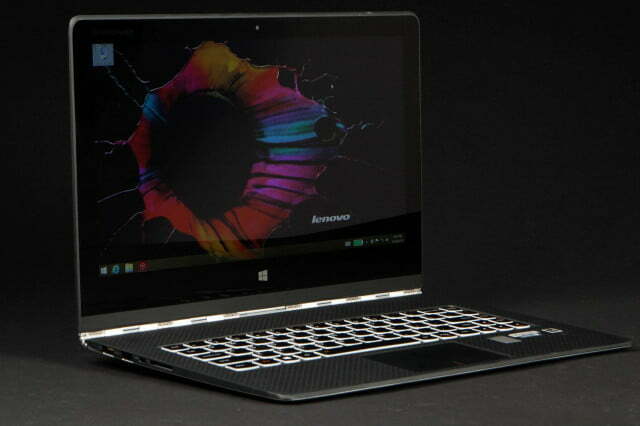 Lenovo also chose to bring back at least one key aspect of the Yoga 2 Pro, including a 3,200 x 1,800 13.3-inch display. Meanwhile, memory and SSD have both been doubled to 8GB, and 256GB, respectively. 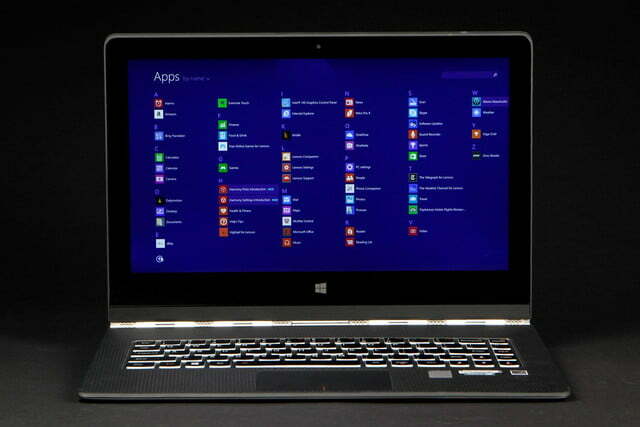 The Yoga 2 Pro was ultimately weighed down by its super high-res display, which led to mediocre battery life. However, at $1,000, it was also significantly cheaper, while the base model Yoga 3 Pro goes for $1,300. Does Lenovo make the same mistakes here, or does the inclusion of Intel’s energy-efficient Core M chip help correct the previous model’s fatal flaw? The introduction of fan-less, smaller, and more energy efficient Core M processors at IFA 2014 by Intel led to promises that we would see significantly slimmer, and lighter devices as a result. The Yoga 3 Pro is the first example of this promise being fulfilled. The Lenovo Yoga 3 Pro is both thinner and lighter than its predecessor, weighing in at 2.62 pounds, and measuring 12.8 millimeters thick. 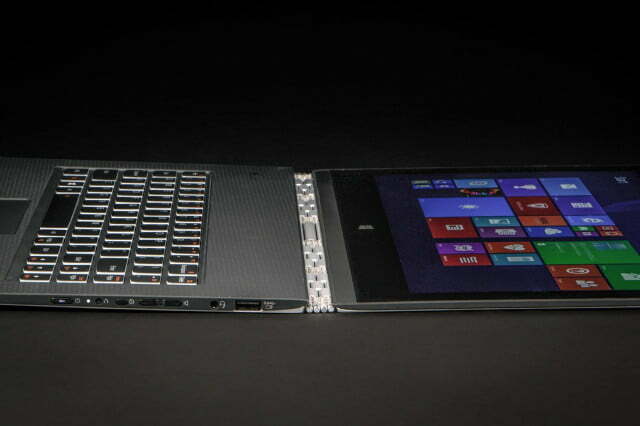 The Yoga 2 Pro, on the other hand, weighs 3.06 pounds, and measures 15.5 mm thick. That’s a significant reduction in both areas. 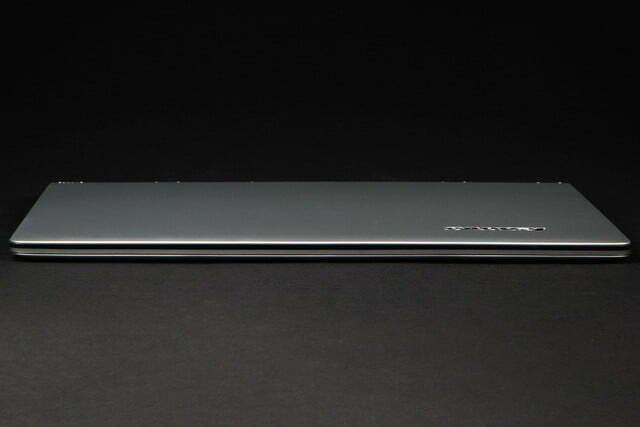 In fact, the Yoga 3 Pro is lighter than the 13-inch MacBook Air, which tips the scales at 2.96 pounds. The surface and underside sport a smooth magnesium-alloy finish that’s pleasant to the touch. A textured coat of rubber on the laptop’s keyboard deck, sides and lip makes the Yoga 3 Pro easier to grip when you’re moving it with the display lid still open, but more often than not, folks transport their laptops with the screen shut. 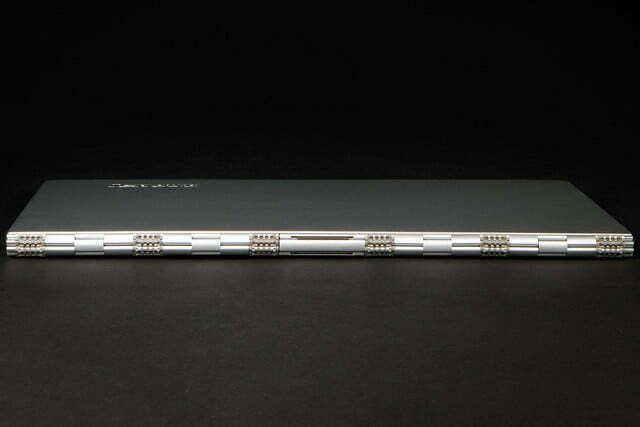 The Yoga 3 Pro is available in one of three colors: Platinum Silver, Champagne Gold, or Clementine Orange. 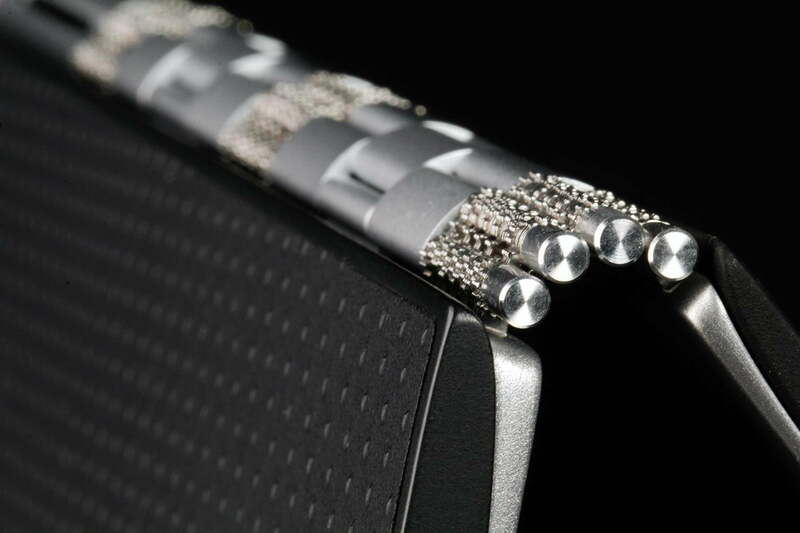 We can’t talk about aesthetics without diving into the most eye-catching newcomer here, which is the “watchband” hinge. It connects the display to the deck at six different points, and is made up of a combination of aluminum and steel. Does it stand out? Sure. But parts of this hinge rattle. 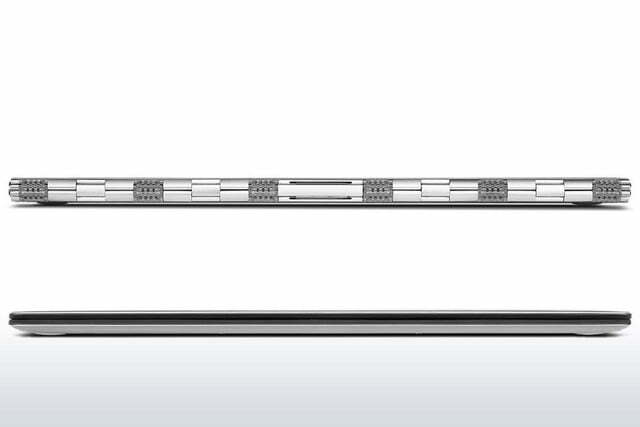 The Yoga 3 Pro is lighter than the 13-inch MacBook Air. 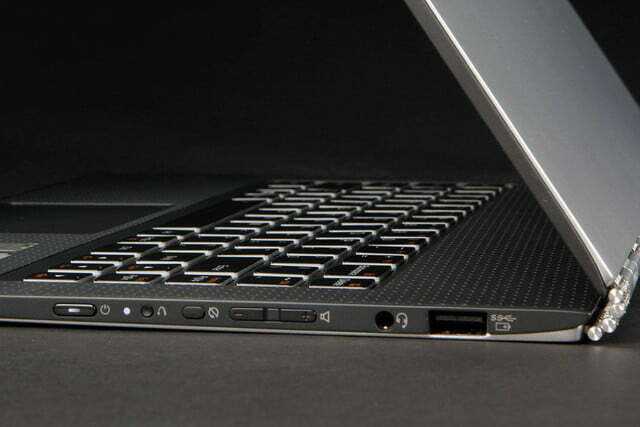 More moving parts are never good for reliability, and the hinge on a laptop is subjected to a lot of exercise. We can’t help but worry about the hinge’s long-term health when all of its moving bits already sound like a rattlesnake. It’s not loud, so you probably won’t hear it when you’re traveling. Remember though, whenever you’re on the go with your Yoga 3 Pro, parts of it that wouldn’t ordinarily be moving will be dancing. The hinge, which is where the Yoga line got its name in the first place, allows you to bend the Yoga 3 Pro into one of five modes. They include laptop, tablet, stand, tent, and an unofficial mode, which we’ll call tabletop. In that latter mode, you plop the Yoga 3 Pro down on a solid surface, and simply bend the screen back until it’s even with it. Voila, tabletop. While the Yoga 3 Pro is significantly lighter than last year’s version, it’s still not comfortable to use as a tablet for long stretches of time. When using it as a slate or watching shows, it started to weigh down our extremities in just a couple of minutes. 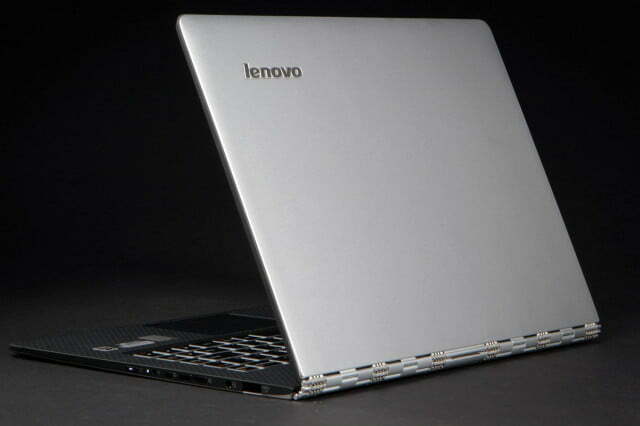 Lenovo is known for making laptop keyboards that range from pretty good to excellent. 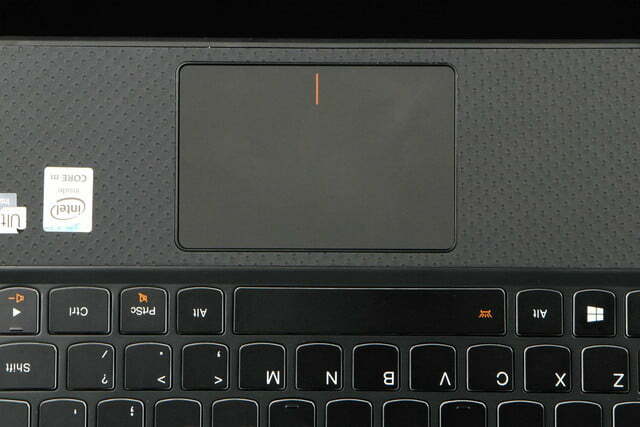 The keyboard found on the Yoga 3 Pro falls somewhere in the middle of that range. Stick to browser-based games and simple titles like Peggle. 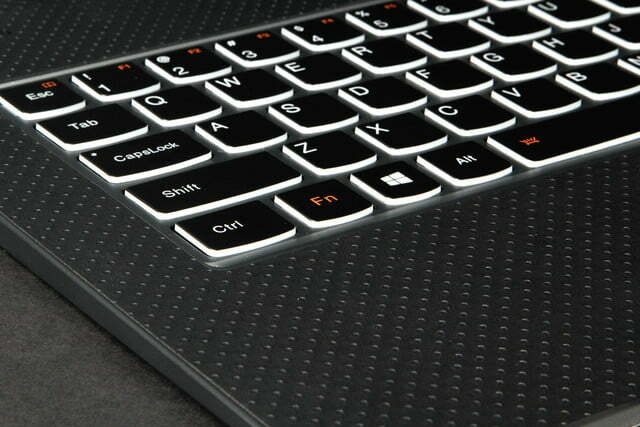 Key travel and feel are satisfying, and overall, the keyboard is pretty comfortable to use. However, a bunch of commonly used keys, including Enter, Shift, and Backspace, among others, are significantly smaller than they have to be thanks to big swathes of unused space on either side of the keyboard. A wider keyboard would also make room between the wrists for a wider touchpad, which at present, sometimes feels slightly cramped. 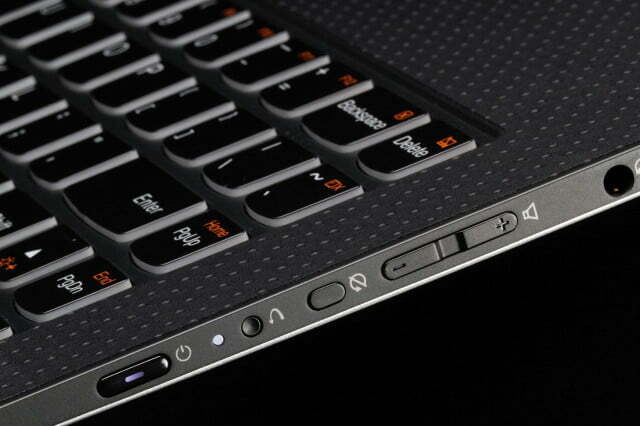 Keyboard back-lighting makes a return here, though there is only one setting. You can turn it on, or off. That’s it. At the very least, the single setting that’s present should make the keys easily visible if you’re working or Web surfing deep into the hours of the night. Lenovo has made improvements in the ports department. 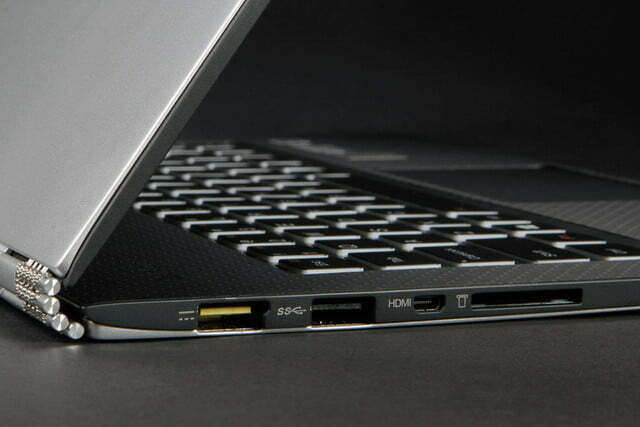 On the right edge, you’ll find a USB 3.0 port, an audio jack, volume controls, and a screen-rotation lock button. There’s also a button here that, when pressed, will kick the Yoga 3 Pro’s recovery software into gear. It’s difficult to activate, but something like this should be. 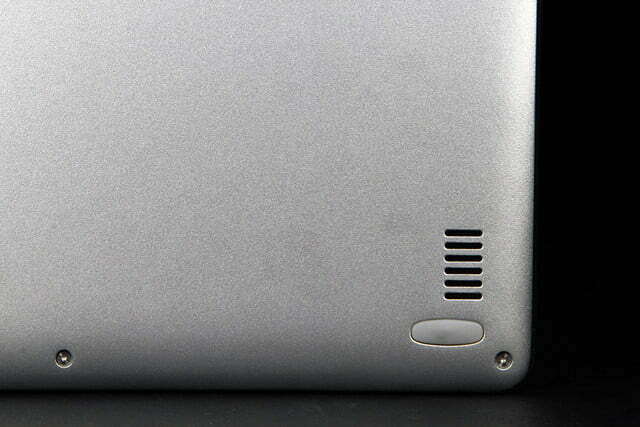 Unfortunately, the side-mounted power button is also a chore to use. You’ll have to feel around for it in order to find it, or lean over to see it, and it’s somewhat difficult to press. Leaving it on the deck like almost every other laptop would have been smarter. 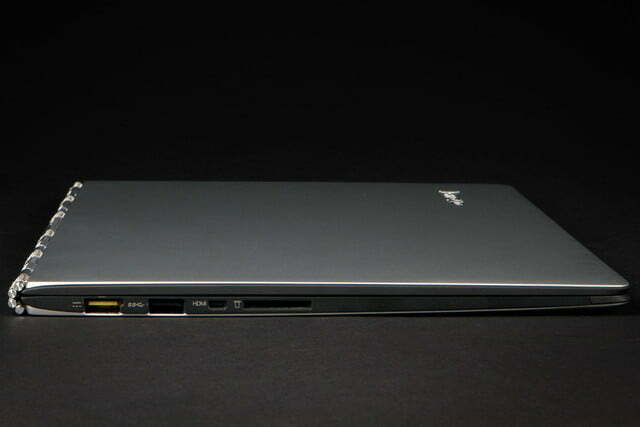 The left edge houses another USB 3.0 port, a mini HDMI port, a memory card reader, and a USB 2.0 port that also doubles as the Yoga 3 Pro’s charging connector. 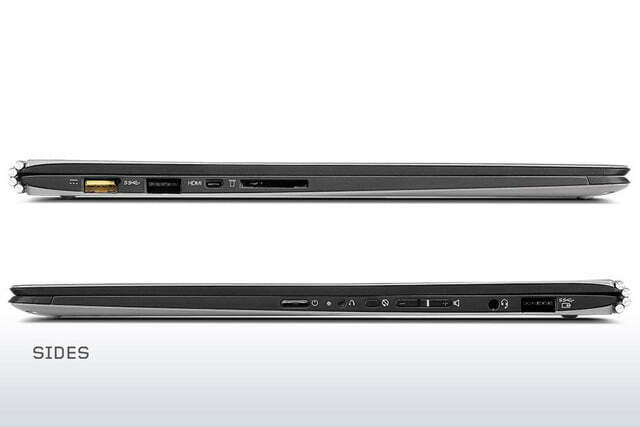 This clever dual-purpose power port gives the Yoga 3 Pro has one more USB port than the Yoga 2 Pro. Wireless connectivity options consist of 802.11ac Wi-Fi, and Bluetooth 4.0. Lately, we’ve been spoiled. Between the 5K iMac we recently reviewed, and now the Yoga 3 Pro, which boasts a crystal-clear 3,200 x 1,800 resolution panel, we’ve been living it up in high-end display heaven. Scrolling was choppy both in the browser and PDF files. High-resolution games, images, and video all look incredibly sharp and life-like on the Yoga 3 Pro’s 13-inch screen. However, older programs do look fuzzy, and we suffered from a similar issue we dealt with when reviewing the Retina iMac: Certain menu and interface elements in games (League of Legends, in our case) look absolutely tiny, and make the game difficult to enjoy. 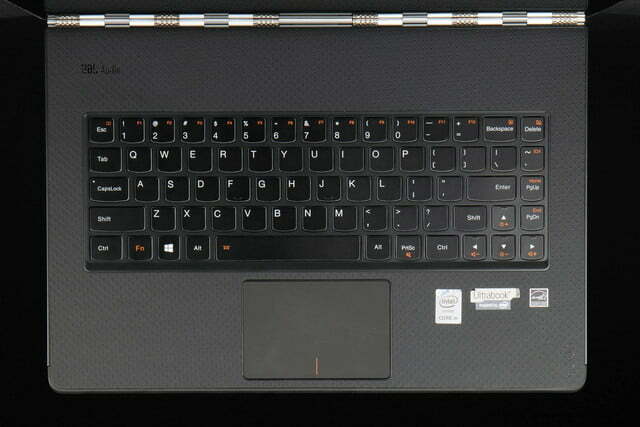 We tried hard to spot individual pixels on the Yoga 3 Pro’s 3,200 x 1,800 screen. Not a chance, and that’s with better-than-perfect 20/15 vision. The new Intel Core M 5Y70 chip in the Yoga 3 Pro is clocked at 1.1GHz, which closer to what you would find on a tablet than a laptop. And it shows. While browsing the Web with 10 to 15 tabs open in Internet Explorer and downloading a couple of programs, the system struggled to handle the workload, wheezing under the weight. Scrolling was choppy both in the browser and PDF files, and switching between tabs resulted in delays from one to three seconds. Is the chip the culprit? Is 3,200 x 1,800 just too high of a resolution for this system to handle? Surely the 256GB SSD and 8GB of RAM weren’t to blame. So we did some tests. On SiSoft Sandra’s Processor Arithmetic test, the Lenovo Yoga 3 Pro scored 29.33 GOPS, which is significantly behind the Dell XPS 13’s grade of 38.79 GOPS. The XPS 13 is the Yoga 3 Pro’s strongest Windows-based competitor in this space, which we awarded an Editor’s Choice badge to when we reviewed it earlier this year. 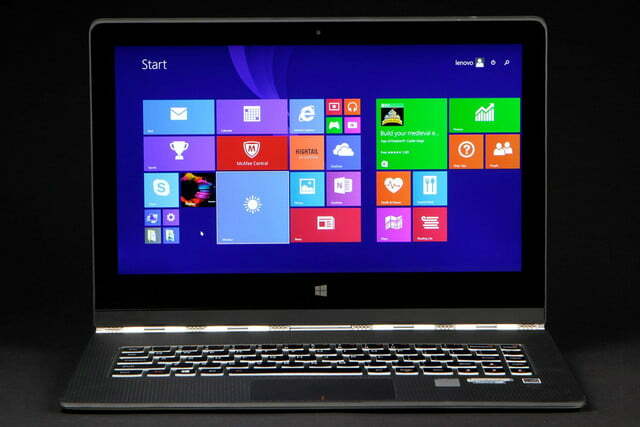 It packs a significantly more powerful Intel Core i5-4200U chip, which was also present in last year’s Yoga 2 Pro. 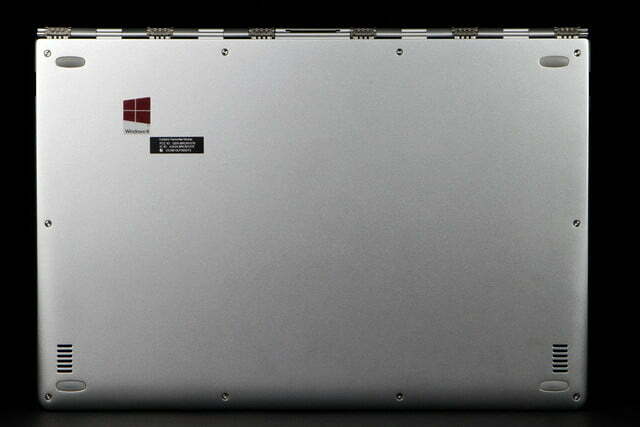 Moving on, we next tested the Core M 5Y70 CPU in the Yoga 3 Pro using 7-Zip. Here’s how it fared. The Yoga 2 Pro and the Dell XPS 13 scored nearly identical grades, while the Yoga 3 Pro is significantly behind both older units. In Geekbench, another processor-centric test, the Lenovo Yoga 3 Pro earned a single-core score of 2,453, and a multi-core mark of 4,267. We didn’t employ Geekbench in our testing process when we reviewed the Yoga 2 Pro and Dell XPS 13, but we did use it with Lenovo’s own Z40 notebook, which wields the same Core i5-4200U processor that the 13 and the Yoga 3 Pro’s predecessor have. The Z40 earned slightly higher a multi-core score of 4,628. Between real-world performance, and synthetic benchmarks, the Intel Core M 5Y70 is clearly not built for strenuous workloads. If you keep multi-tasking under control, though, it should at least make for a passable computing experience. Ultimately, this chip is best suited for tablets, Chromebooks, and dirt-cheap notebooks. The 256GB SSD fared much better when we put it through its paces. In HD Tune, it earned a read speed score of 306.9MB/s, with an access time of 0.08 milliseconds. The last time we tested a system with an SSD, it was an Asus ROG G751 gaming notebook, which got an average read speed of almost double. That system costs about twice as much though, so we’re not surprised that its drive is significantly better than the Yoga 3 Pro’s, which is still a huge step up from a mechanical drive. Both the Yoga 2 Pro and Dell XPS 13 also ship with SSDs, but at 128GB, both competitors sport half the storage space that the Yoga 3 Pro boasts by default. Moving on, we’re met with the Intel HD Graphics 5300 GPU that’s built into the Core M chip. Processing power may not be the CPU’s forte, but how does its graphics chip handle visual workloads? Though the Yoga 2 Pro and the Dell XPS 13 aren’t exactly world beaters in either of these tests, they’re in a whole other dimension compared to the Yoga 3 Pro. Both of them have well over 1,000 points on the Yoga 3 Pro in 3DMark’s Cloud Gate test, and scores that are at least 200 points higher in the more demanding Fire Strike benchmark. Synthetic tests are one thing, but combine that with real-world performance, and you’ve got yourself a crystal-clear picture of what a PC’s graphics chip can do. So, we fired up League of Legends, a freakishly popular game that’s also the least demanding title which we use to test out GPUs. Forget about enjoying a game like this on the Yoga 3 Pro. With League of Legends running at the display’s native resolution of 3,200 x 1,800, the game ran between 18 and 8 frames per second. The game’s visual details weren’t even cranked up. They were set to Medium. 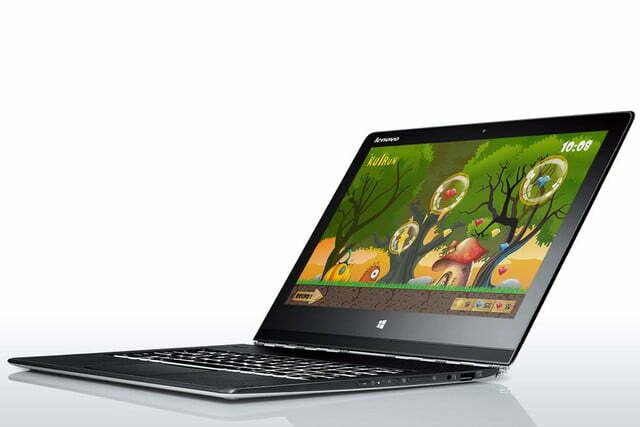 Stick to browser-based games, and simple titles like Peggle with the Yoga 3 Pro. Sure, you could turn down the in-game resolution to something more manageable like 1080p, but what’s the point of getting a laptop with such a high-res display if you have to tune down the settings to enjoy a game that has modest hardware requirements? Here the latest Yoga falls short, big time. Again. In our Peacekeeper Web browsing benchmark test, the Lenovo Yoga 3 Pro lasted only three hours and 44 minutes on a single charge. That’s a notable improvement of 30 minutes over the Yoga 2 Pro’s time of three hours and 14 minutes. 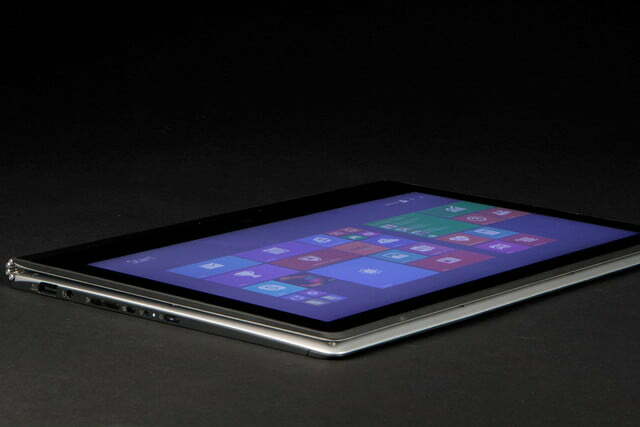 However, the Dell XPS 13 is in another league here again, lasting seven hours and 48 minutes in the same test. An extremely high amount of pixels drastically taxes the battery. How could these two notebooks be so far apart in such a key area? 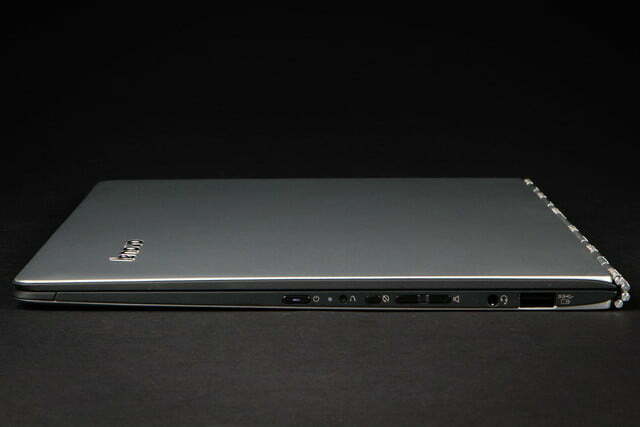 Simple: The Dell XPS 13 has a 1080p display, which taxes the battery far less. These days, 1080p is the sweet spot of display resolutions on laptops, where battery life has to be a key consideration. Unfortunately, Lenovo makes the same “more is better” mistake this time that it did with the Yoga 2 Pro. That misstep is slightly offset by the inclusion of Intel’s new Core M chip, but it only helps the Yoga 3 Pro gain 30 minutes of endurance on its older cousin. Even so, battery life of under four hours just can’t compete with an adversary that offers more than double that. Using a Core M-powered laptop like the Yoga 3 Pro does have its perks. Because Core M chips are built to be super efficient, and much smaller than their predecessors, the Yoga 3 Pro is practically dead-silent, and has a penchant for keeping temperatures low at all times. Even during the most stressful tests, we barely heard a peep out of the system. Also, the only area where we detected any heat was the surface directly underneath the battery, which is positioned at the back of the system’s deck. Both the Lenovo Yoga 3 Pro and the Dell XPS 13 offer a one-year warranty. 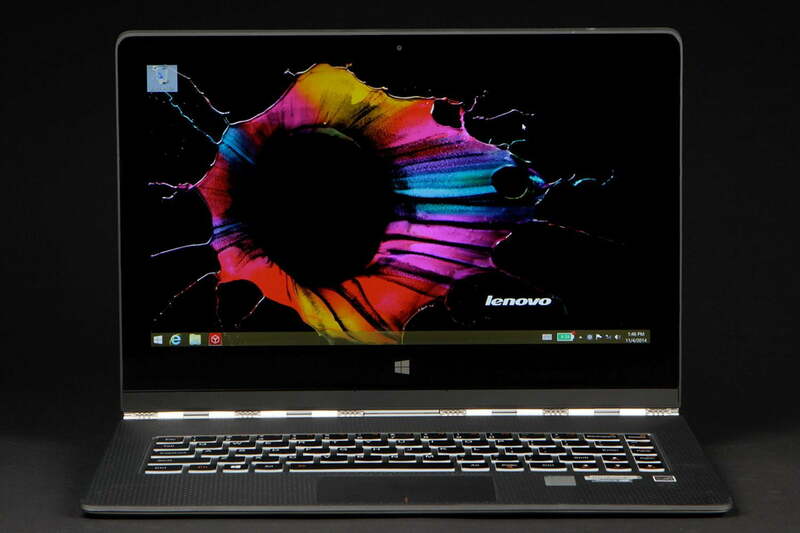 The Lenovo Yoga 3 Pro is significantly lighter than its predecessor, and wears a fabulous display. Its two halves are connected by an attention-grabbing hinge which you won’t find on any other notebook. 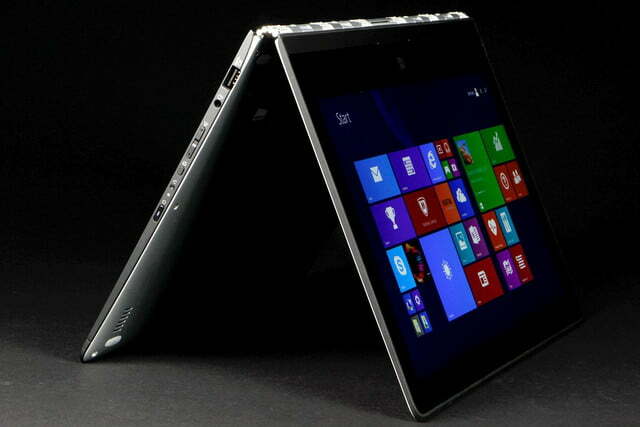 But the same aspects that make the Yoga 3 Pro unique put it way behind its primary competition. The lighter weight comes as a result of an anemic new processor, the ultra-sharp display drains battery quickly, and the fashionable hinge rattles. The Dell XPS 13 is just a better balanced system overall. Sure, its display “only” has 1080p resolution, and it doesn’t bend over backwards like the Lenovo, but it also offers excellent performance across the board, superb battery life, and you can snag one for a low as $900 (or $1,200 directly from Dell). 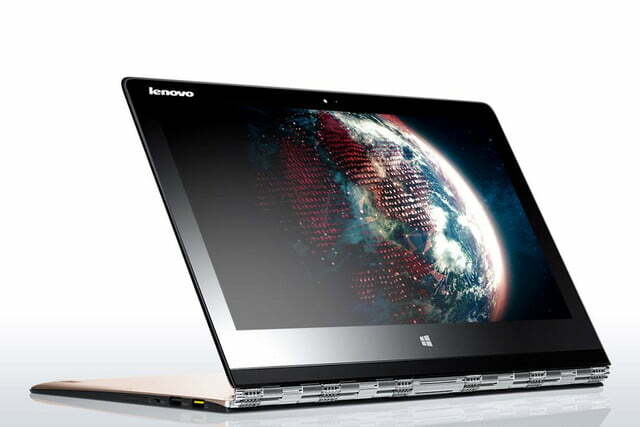 That’s $400 less than what the Lenovo Yoga 3 Pro is going for. This, combined with the fact that the CPU and GPU are weaker than what’s in both the XPS 13 and the Yoga 2 Pro, means the newest iteration is a less than ideal buy. If you’re flush with cash and you desire an astounding display in a super-slim, acrobatic package, by all means, grab the Yoga 3 Pro. Otherwise, you’re best off with the XPS 13.